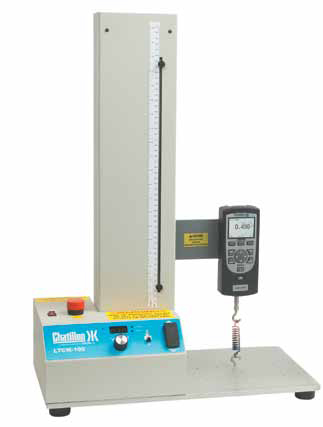 The DFS II-R-ND allows the user to change SLC load cells adding the flexibility of having one base indicator and several load cells to meet different testing needs. 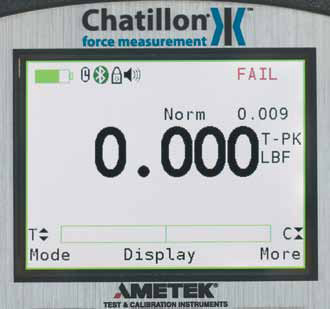 The Chatillon® DFS II Series offers the best price performance of any digital force gauge available today. Our brand new DFS II Series of Digital Force Gauges is the first of their type to offer wireless data transfer and communication via integral Bluetooth. The DFS II-R-ND allows the user to change SLC load cells adding the flexibility of having one base indicator and several load cells to meet different testing needs. 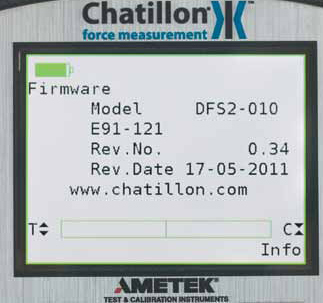 The Chatillon® DFS II Series offers the best price performance of any digital force gauge available today. This compact, easy-to-use force gauge is designed for basic and complex applications. Ideal for handheld or test stand applications, the DFS II may be equipped with integral loadcells or smart remote sensors for load measurement or torque measurement. Measurement accuracy is better than 0.1% full scale in integral load cell or dedicated remote models. A large, easy-to-read, high resolution, full color dot matrix LCD display supports a variety of standard gauge functions including normal and peak readings, high/low limits, setpoints, pass/fail results, statistical results, load averaging, load comparisons, % and sharp break detection, loadcell actuation and direction. Loads are displayed in ozf, gf, lbf, kgf and N units. The display can be inverted and displayed results may be "hidden" from the operator. The DFS II offers password protection for gauge set ups. The DFS II now also includes multiple language interfaces. The DFS II is able to change the display language from English to Spanish, French, German, Portuguese, and Chinese. The user can view the screen in color and a local language. The DFS II gauge comes standard with an RS232 cable, carrying case, battery adapter/charger, testing accessories and NIST Certificate of Calibration with data. The DFS II is supplied standard with Bluetooth® capability for communications with the gauge. RS232 and USB communication capabilities are also onboard. A large, easy-to-read full color LCD can display readings, icons and visually indicate gauge or test status using various colors. The high resolution display features brightness adjustments and can be inverted when required. The display can even be "hidden" at the press of a button. A load bargraph indicating load direction, measured load and safe load and helps prevent overloads: the load bar changes from green to red to indicate proximity to load cell capacity. The integral loadcells feature mechanical overload protection at 150% Full Scale. The rubber keypad features dedicated and dynamic function keys. The function keys correspond to displayed options and guide the user during operation. A navigation pod lets you navigate through the menus and to scroll and change values quickly. The innovative "i" key can be used to display critical information on the gauge such as gauge capacity and resolution, battery life remaining, loadcell overload history, even service information including last calibration date, or the location of service centers. 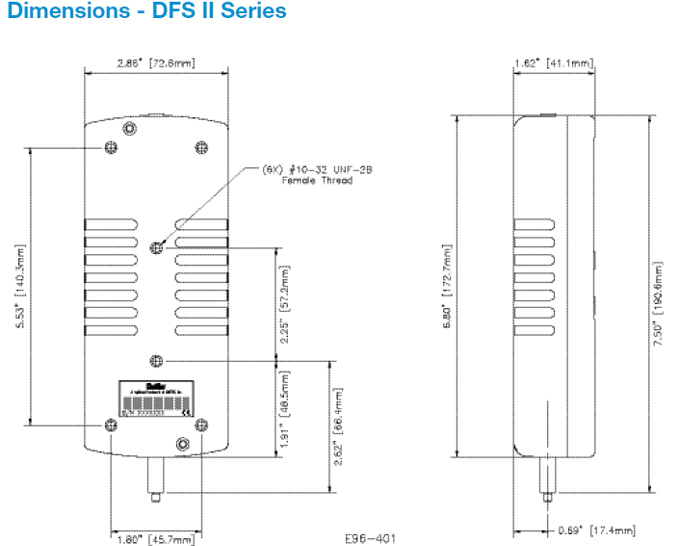 The DFS II Series features an integral loadcell sensor that delivers repeatable, accurate results. The innovative load bargraph shows dynamic load, direction of load and warns you of pending overload conditions including by changing from green, to yellow, then red. Smart technology in the gauge even keeps track of overload history to aide in maintenance and troubleshooting. Break detection is provided and two types of breaks are supported. A sharp break can be used to detect whenever the load measurement drops 5% from a peak load. Alternatively, you may override the sharp break and setup the gauge with a % break detector. The % break detector allows you to set the drop percentage that is used to define a break. This type of break is useful on samples with high elastic characteristics. The DFS II Series may be used to detect a contact break. Using a jumper on Pins 8 and 10, the gauge will detect when a contact is "opened" and freeze the display reading showing the force required to break the contact. Two methods of load averaging are standard with your DFS II.Load averaging is useful to determining load characteristics of long test periods or for samples with characteristically noisy load readings. This method allows you to define a load threshold. The gauge will begin taking readings once the load threshold has been reached and will continue to take and average readings until the measured load falls below the threshold value. The Time method allows you to establish your load averaging based on a load threshold and time duration. The load threshold determines the start of the averaging, while the time duration defines the length of the test period. The gauge will begin taking readings when the threshold is reached and will continue to take and average readings until the time duration has expired. The DFS II Series comes standard with digital and analog outputs. RS232 outputs are supported with baud rates from 9600 to 115,600. Simply select the baud rate whether or not you want to gauge to transmit with or without units. You may select the Mitutoyo output when communicating with a Mitutoyo device. Or, you may use the ±2V analog output to drive alarms or other ancillary devices. The DFS II also communicates through the USB connection using digital protocols. If you want to operate without cables, the DFS II is also supplied standard with Bluetooth® capability making it easy to get results without a cable. The DFS II is supplied standard with standard Chatillon protocol and will work with existing test stands. The gauge also supports Mitutoyo and Alternate protocols. You may filter the display and peak readings with the DFS II Series. The default display rate is 10Hz, however, this may be lowered to 4Hz to accommodate noisy signals. The peak sample rate may be specified as 10Khz, 1Khz or 10Hz to suit specific application needs. A simple menu structure is used to specify filter rates. The DFS II Series has a universal mounting backplate that enables you to fit the gauge to commonly used Chatillon force testers including the MT Series and LTCM Series testers. The DFS II Series incorporates flash memory and hosts a set of self-diagnostic functions for monitoring the display, keypad and electronics. Using the "i" key, you have immediate access to battery conditions, including estimated battery life remaining. You can also view loadcell status, including the number of overloads that have been applied to the gauge. Zero offset verification is standard and a step-by-step calibration procedure is built-in allowing you to calibrate your DFS II gauge with certified standards. Your DFS II can make use of our Nexygen DF software for gauge applications. With Nexygen software, you can perform tests and graph results automatically using a personal computer. Load results may be shown graphically versus time. Tabular results are displayed and can be used to create relationships, queries or used to produce reports. You can format the display to match your requirements and establish pre- and post-test questions that require the operator to answer questions based on the test setup. Setup is easy too. Menus, radio buttons and prompts guide you through instrument and test setup. Since Nexygen DF software is OLE2 compatible, information can be exchanged transparently with Microsoft Word, Excel, Access, PowerPoint and Outlook. Regardless of the configuration ordered, your DFS II Series is supplied ready-to-go. 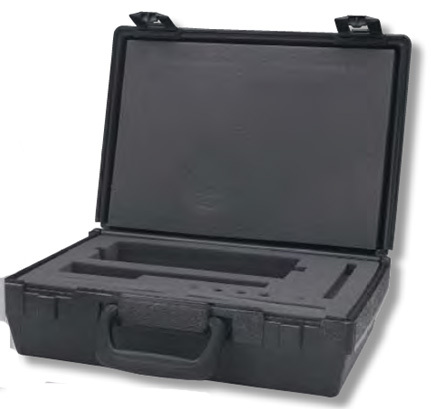 The gauge and accessories are supplied in a durable carrying case that is designed for all components including adapters, load cells, software, and battery charger. The units are delivered with a long life NiMH battery cell that is rechargeable. The charger supplied is a universal charger: no need for adapters for different power supplies. The compliment of adapters is comprehensive and includes a hook, compression tip, extension rod, pointed tip, chisel tip, and a notch tip: everything that you need to get started. And, the DFS II Series is designed to mount directly, or with an available kit, on Chatillon manual and motorized test stands. This is the unit to select if there is a need for multiple ranges of measurements required: one unit can do it all. It is also more economical to purchase the DFS II-R-ND with SLC load cells than purchasing several individual gauges for the different range applications. The SLC load cells for the non-dedicated models are also available in higher ranges, to 10,000 lbf, allowing for a wider range of applications. The gauge will operate the same as if it were an integral load cell and all functions will operate normally. There is a small price to pay for the additional range and economical flexibility of having non-dedicated remote load cells. If the non-dedicated remote load cell is chosen, the load cell is not dedicated to that model so the calibration is such that it allows for some variance when connected to different gauges. 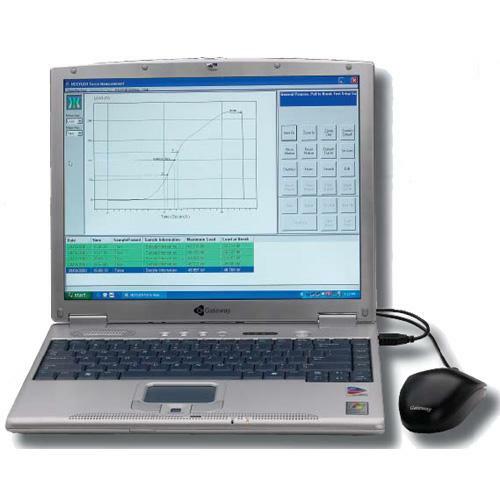 These units carry an accuracy of ±0.25% of full scale for standard ranges and ±0.50% of full scale for the extended ranges making this an accurate tool given the flexibility. The DFS II Series with dedicated remote load cells is the ideal solution for applications that require a measurement where there is no room for the gauge. The gauge may be handheld our remotely mounted and the load cell may be placed right where it needs to be to take the reading. This is the answer if one load cell will address all of the testing needs or if multiple gauges will be used. The user can have the DFS II Series gauge where it needs to be so that a reading may be easily taken or so that it is not interfering with the test being performed. The gauge will operate the same as if it were an integral load cell and all functions will operate normally. If the dedicated remote load cell is chosen, the accuracy in the ranges of the standard integral load cells applies. The load cell is dedicated to that model and may be calibrated specifically for that gauge. These units carry an accuracy of ±0.10% of full scale: a highly accurate device. In addition to the force measurement capability of the DFS II Series with non-dedicated remote load cells, Chatillon also offers the STS Series of remote torque sensors. When combined with the DFS II-R-ND Series, these rugged and accurate sensors turn your force gauge into a torque measurement device: no need to purchase another gauge. As is the case with the dedicated load cells, the gauge may be handheld our remotely mounted and the torque sensor may be manipulated to take the reading. This configuration also gives the user the flexibility of having force and torque measurement in a single gauge. This is the unit to select for maximum flexibility: one unit and interchangeable sensors can do it all. 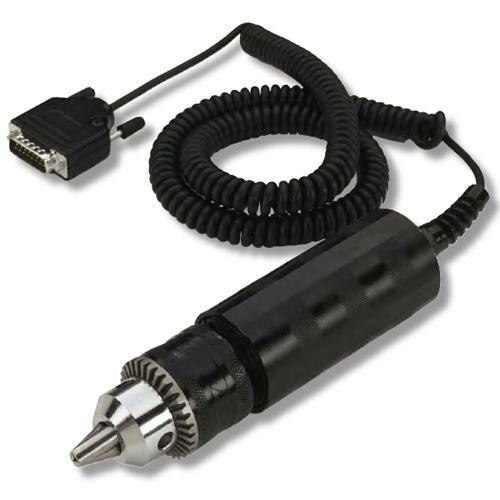 The STS series of torque sensors is available in ranges from 3 in-lb to 200 in-lb. The gauge will operate the same as if it were an integral load cell and all functions will operate normally. There is a small price to pay for the additional range and economical flexibility of having non-dedicated remote torque sensors. If the non-dedicated remote torque sensor is chosen the torque sensor is not dedicated to that model so the calibration is such that it allows for some variance when connected to different gauges. These units carry an accuracy of ±0.30% of full scale for standard ranges making this an accurate tool given the flexibility. The CHATILLON® SLC Series loadcells are full-bridge strain gauge sensors complete with 15-pin plug. These loadcells are used with the Chatillon DFS-R-ND Series digital indicator. They may also be used with the Chatillon TCD Series digital force testers (recalibration with a TCD Series Console is required). The loadcell values and sensitivity factors are stored in memory within the sensor plug. When connected to a DFS-R-ND indicator or TCD Series force tester, the capacity and calibration points are automatically recognized by the instrument. The instrument then becomes a full-featured load measurement instrument. The loadcells are connected to the DFS-R-ND or TCD Console with a retractable cord that extends fully to nearly 9 ft. (3 m). 0.013 +0.004? 0.015 +0.004? 0.006 +0.003? 0.008 +0.003?? 0.012 +0.003? 0.018 +0.003? 0.013 +0.003? 0.011 +0.003? The CHATILLON® STS Series torque sensors are full-bridge strain gauge sensors complete with 15-pin plug. 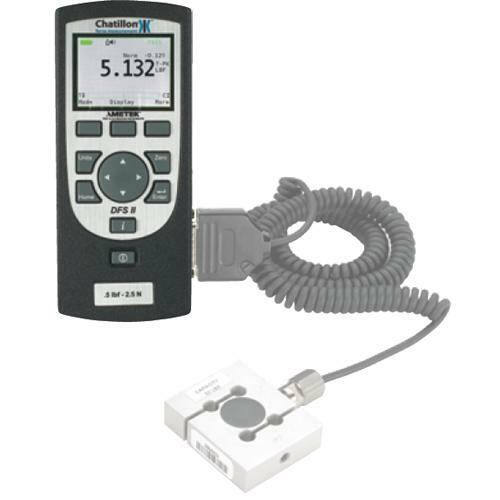 These sensors are used exclusively with the Chatillon DFS-R-ND Series digital indicator. The sensors torque values and sensitivity factors are stored in memory within the sensor plug. When connected to a DFS-R-ND indicator, the capacity and calibration points are automatically recognized by the instrument. 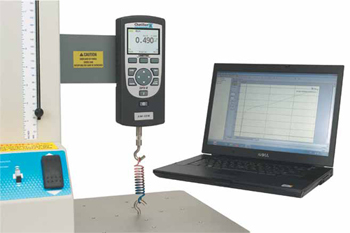 The instrument then becomes a full-featured torque measurement instrument. The STS Series torque sensor meets ASTM E4 and BS EN ISO 7500 part 1 for a +0.3% accuracy sensor. The sensors are connected to the DFS-R-ND with a retractable cord that extends fully to nearly 9 ft. (3 m). 5.62" 1.25" 1.0" 1/16 - 3/8"
6.0" 1.62" 1.2" 5/64 - 1/2"
6.0" 1.62\" 1.2" 5/64 - 1/2"